I am finally getting a job so I will now be able to save for armor again Yay! I dont nesicarrily know what period my breastplate is closest to but Im not trying to be spot on with this. If I was trying to be spot on I wouldn't fight in it because of that. The Revival Arming Cote and HE Arming Cote are much more late 15th century designs (despite what the marketing may say), but they are very functional. If you're really looking for early 15th century, neither of those are really appropriate. If you just want a functional garment that will support your armor, then both are excellent provided you get them to nail the fit. Historic Enterprises is well known for getting their arming doublets spot on, and people swear by them, but again they're really a later 15th century design. Or if you want an all-in-one solution, a very well tailored Charles de Blois style pourpoint. Sir Ian is correct for the time frame you narrowed it down to. I've used a Revival gambeson which is cut similar to the Charles de Blois, but still has the "off the rack" slight fitment differences compared to one made to measure. I don't know if they do them to custom sizes, since I got mine used. It's important to note the Revival gambeson does not have real grand assiette sleeves (the quilting pattern just makes it look like it does), it's not intended to be like the Charles de Blois. It's not usable for proper leg harness suspension like a real CdB can be made to be for a variety of reasons. It would function like the image I linked above, just usable for a foundation on the upper body, requiring a discrete leg suspension system. It's important to note the Revival gambeson does not have real grand assiette sleeves (the quilting pattern just makes it look like it does), and as such would be unusable for suspending leg harness if that was a desire. Yeah, assuming we're talking about the 14th Century Linen Gambeson, it would also be a poor choice for suspending leg harness since it's not really designed to cinch in tightly around the waist either. 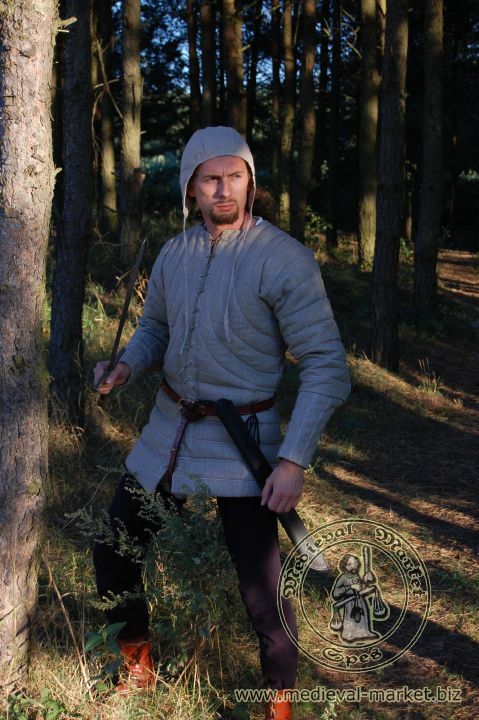 On the website they show Christian Tobler using it with armor, and I can't see how he's suspended the legs (I suspect it's their "pourpoint" he's using underneath), but a combination of a lendenier worn underneath the gambeson might be a workable solution. Personally I find this gambeson to be a great choice for unarmored combat. For armor, the problem is with the leg suspension. Good point about the leg harness. I have this one, "14th Century Cotton Gambeson", not the linen one. I'm not sure if it's the same pattern as the linen? It says it has the grand assiette sleeve, but I don't know enough about the tailoring to say for sure if it is or isn't. Sir Ian, that's just from the quilting pattern? When I used it (I think only a few times), I had mail and a solid breast/back cuirass, which was cinched in tightly while I raised my arms above my head. End result was that it kept the undergarment from pulling too much on my shoulders as if it were cinched in at the waist, but historical accuracy on that method is questionable at best (as in, I have zero documentation to prove it, it just worked). Similar to "blousing" mail, where you lift your arms and tighten down a thin belt to keep it from pulling entirely on your shoulders. From a practical standpoint, it worked, but I wouldn't say it's ideal. I still have my linen revival gamby and just checked. They're slightly exaggerated armholes but they're not grand assiette sleeves. The arm cap looks like it's just a tube with a single seam running down the back of the arm, not inset with all the gores to give the large circular arm cap of a real grand assiette sleeve. The quilting pattern continues well into the chest beyond the shoulder seam to give it the look, but real grand assiette sleeves are usually very deeply inset into the chest. The description is the same for the cotton one, so they may be the same pattern. Oh, interesting. That's the tailoring knowledge I know nothing about. Thanks for the info! Page created in 0.735 seconds with 24 queries.